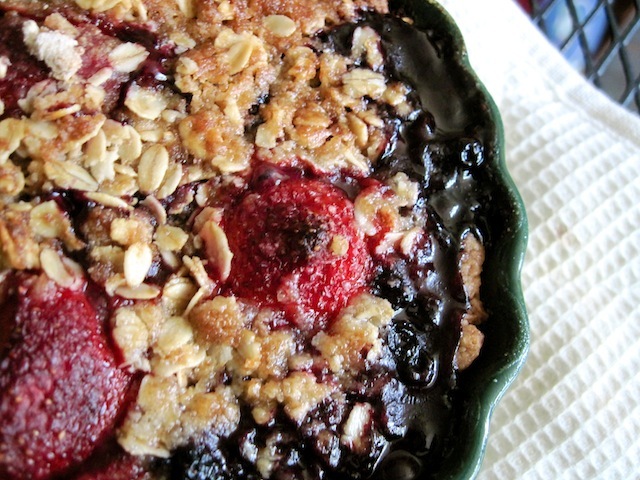 Good News for Your Sweet Tooth: Blueberry Crumble Pie – Eat Me. Drink Me. I want to share this recipe with you because it was so ridiculously easy. We whipped it together in about ten minutes and then just sat back and relaxed while pie magic happened in the oven. So if you, too, find yourself pie-less, you can change the facts of your life with things you probably have somewhere. There’s this amazing pie crust recipe which calls for 2 cups flour, 2/3 cups vegetable oil, and 1/3 cups milk. I used this recipe and scaled it down to fit a small half-sized pie dish. Knead flour, vegetable oil, milk, and salt together until a lightly glossy, not sticky ball of dough forms. Press it into a pie dish. In another bowl, mix your pie filling and put it in the dish. We used frozen blueberries, frozen strawberries, sugar, cinnamon, and honey. But other things you could make into pie in a pinch: apple slices, raisins, jams, dried fruits, dates, nuts, Nutella (er… maybe). 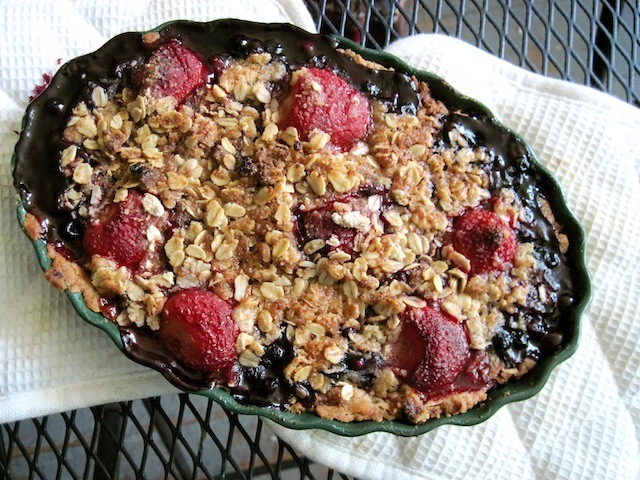 Then, make a quick crumble crust by blending together the butter, flour, brown sugar, and rolled oats with your fingers. Crumble the crumble over your pie filling and bake in a 450 F oven for 45 minutes. Until it’s done. You’ll know. It’ll be bubbly and gooey and smell like heaven.